Though Ford had been selling some of their English-built cars and light trucks in the US and Canada since 1948, the first German Fords to be officially sold here was the Taunus 17M which debuted in the US in 1958. The Taunus 17M (code name P2) was the top of the line German Ford at the time and was powered by a straight 1700 four cylinder OHV engine (67 bhp), delivered through either a 3 or a 4-speed transmission with a column mounted shifter (or with an optional "Saxomat" semi-automatic). The 17M came in two models, Standard or DeLuxe and three body styles -- two and four door sedan and two door station wagon. 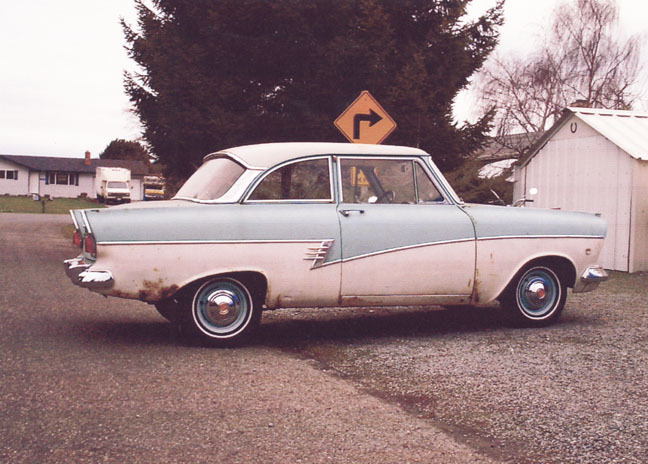 In the United States the Taunus was mostly sold by MEL (Mercury-Edsel-Lincoln) dealers, but was franchised to Ford-Monarch dealers when introduced in Canada for 1959. 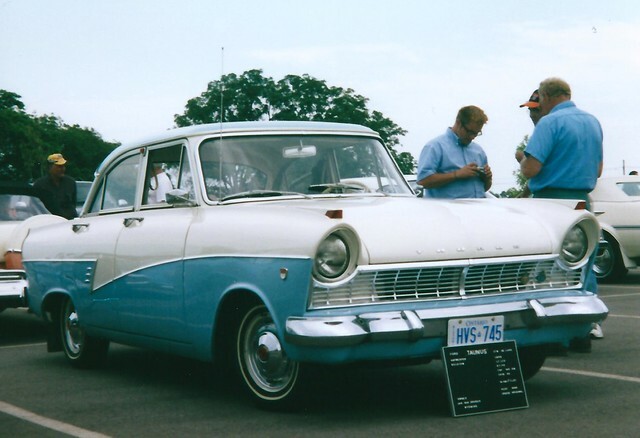 In mid-1959 Ford of Canada began importing the smaller 12M (code name G13), which was powered by the 1500 (60 bhp) version of the Taunus OHV four. In March 1960, Ford announced that the 12M was to be sold in the USA, though it is not clear that any ever were. A few months later Ford decided to discontinue the Taunus line in North America. However Ford of Germany was still happy to build North American spec cars for anyone who wanted one (think mph speedometer, LHD, red rear turn signals and round sealed beam headlights). A few such cars were brought in as personal imports and at least three are known to have survived. After the discontinuation of the Taunus in 1960, German-built Fords would not be officially available here until the Capri arrived ten years later. Here are some links to European Taunus websites that I enjoy (even though I can't read them). One is in Holland, one from Norway, and one from Germany. Thanks to Alejandro, Club Taunus Argentina has made me a honorary member of their club. 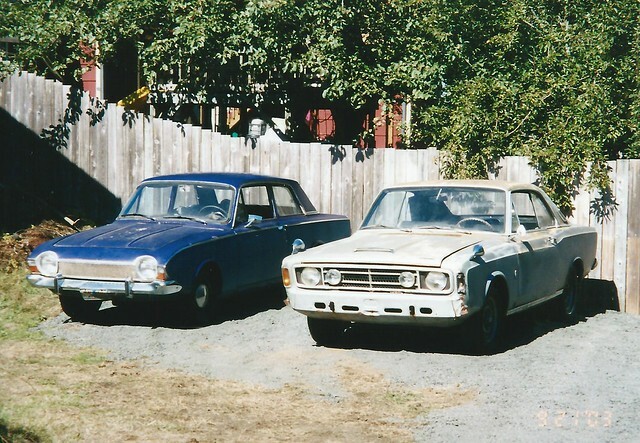 The Taunus P2 & P3 were sold in Argentina when new. In 1975, Ford Argentina began building the TC Taunus there. The Argentine versions were a little different than those sold in Europe. For example the 2.3 Lima was offered, as was a coupe version of the Mk III version of the Taunus (early 80s). Im so proud because the Taunus is alive in USA, thanks to you. I am going to start posting photos of cars from the North American Taunus Registry. Circa 1963 P3 Taunus 17M Station Wagon as seen at L & L Classic Autos in Wendelll, ID, January 2008. 1968 20M RS2300 formerly owned by Michael MacSems (WA), recently (2008) exported to Norway. 1970 15M XL Coupe (1.5 V4). Imported from France by Jose Franco (CA) in the early 2000's. Last summer (2007) this car was on Craig's List for a reasonable $2,500. However I have not heard if it sold. 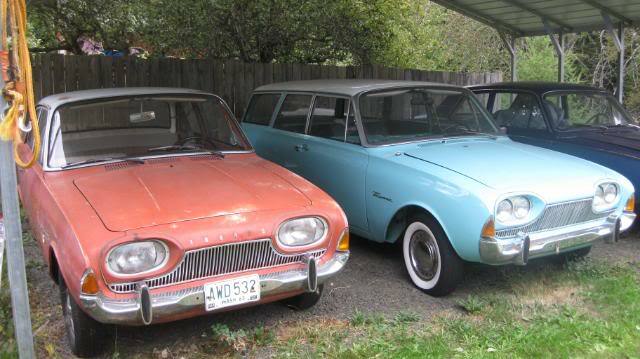 There is a 1964 Taunus 12m P4 2 door for sale in PA and there is a Taunus 15M P6 wagon in Canada. 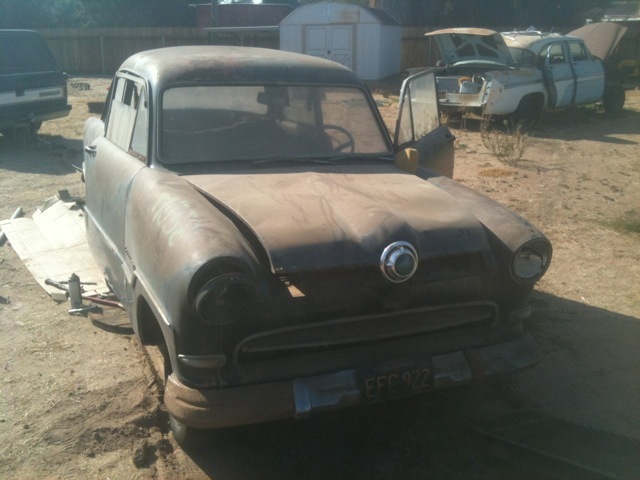 Here is a 57 wagon for sale in Canada. Here is a 1952 in Great Falls. Bob, Thanks for those Taunus links. In the last few months I have been contacted by a guy in Kansas who found a '59 P2 in a field and another guy who bought a 1955 G13 15M from a wrecking yard in California. Amazingly, they are still out there (though most of them don't have much floor left). Yes there out there but can be very hard to find. I am still looking for a P4 or P6 parts car that is a reasonable distance from where I live. There's a 1957 Ford Taunus 17M station wagon listed on eBay, right now. When they debuted in August 1957, were they considered 1957 or 1958 models? If they were considered '57 models, is there any difference between ;57 and '58 Taunuses? And, is there a way to tell from the VIN or any data plate on the car what year it is? Chris. I would consider them to be MY 1958 models. I don't know of any changes on the P2 until MY 1960. Here in the states it would probably be called a 1958-model car. In Germany at that time, though, makes were still usually registered by calendar year. Often data plates will have "Baujahr" (calendar year of manufacture) stamped on them. This may or may not coincide with how they were registered in export markets (or even in Germany, because cars built late in one year were sometimes not sold till the next year). When using this method to date older cars that were clothed by outside coachbuilders, keep in mind that the "Baujahr" is for the chassis only, and not the completed vehicle. I received this e-mail and photo from Jay Books in California in 2013. This is the only G13 Taunus that I have heard of in the States. thanks a lot for these North American registries, I propose you the link where you can get to how proud to be an American!